Here's a picture of my wind generator in action. The eagle eyed amongst you will see the tail has a home made extension stuck to it. The issue I'm having is that the wind generator keeps turning out of the wind, for no apparent reason. It's really frustrating, as the wind generator is not producing the power it should as it turns out of the wind, slows down then turns back into the wind and speeds up again. There is no specific pattern to which direction it turns out, and no particular wind speed or direction either. I've been working with the folks at Eclectic to resolve this. They have been extremely helpful, to the extent of replacing the whole generator for me. I am now sure it's not the generator, but something in the setup on Lady Jane. But so far I just can't work out what the issue is. The cable, or for that matter any of the connections, from the generator to the batteries, as I've changed all that. The connection, as this is all connected up securely and correctly. 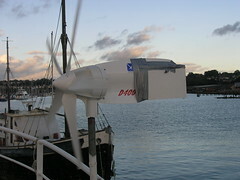 The inverter, as it still faces out of the wind with the inverter disconnected. 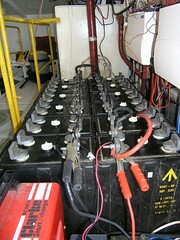 The battery de-sulphinators, as they have been disconnected to test this. Any of the boats 24V systems, as they have been isolated to help find the problem. The voltage regulator, as this has been temporarily bypassed. Any turbulence, as the generator has been moved to endure this is eliminated. The best I've been able to do is to extend the tail, so the generator turns back into the wind as fast as possible. This maximises the power I can get from the generator. I blame the RNLI for this one. After seeing the pristine clean, white, decks of one of their boats on TV recently, I thought "No reason Lady Jane should not have that". Well, after the work to get this far, I can now think of several reasons. The bright, clean effect keeps me going though. 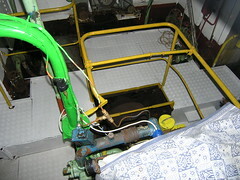 Eventually all of the engine room deck will be this colour. A great project for those rainy days. Here you see Fred and I have now got that all important second coat of primer on. Experience has shown that unless we get at least a second coat on pretty quickly, the rust does not take long to peep through what must be microscopic holes left in the first coat. As you can see from the small stretch of red there, we ran out of the grey just before the end. I'll catch up the missed bit as part of painting the second coat on the next section I rust bust. I've been looking into augmenting my wind generator with solar power. For me, the bigger panels I need for my 24V system would cost around the one thousand odd pounds mark (US$ 1,600), so some research makes sense. The concept seems idyllic - slap in a couple of solar panels and job done. Free power for the next twenty odd years with no maintenance other than an occasional clean of the panels. After looking into it a little more, I must say that I'm somewhat under whelmed by the whole idea. Green issues aside, solar power looks very expensive for pretty poor returns. 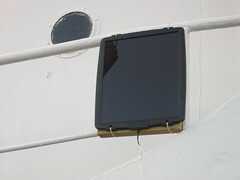 The panel you see is one of two different types I bought for my solar power experiments. This one for my on-board 12V system. Forty quid that cost me, and it only produced a sorry amount of power over the course of the last few weeks. Not even enough to keep up with my intermittent use of the radio. Oh yes, and the battery is in really good shape as it's quite new. 4.8w output I think is promised on the box, but in reality I think it only does that when it's pointed directly into blazing sunlight. That's not going to happen. Especially here in England in the daylight savings months. Before we go any further, bear in mind that this panel could not keep up, so I'd have to use a generator to top up the power at some point anyway. Forty quid buys me forty litres of petrol. At .4 litres per hour (1/4 load from here), this gives me 100 hrs (6000 minutes) generator runtime. In reality the generator will use less petrol than that, as the load to charge the 12V battery is not that significant (say 10 amps * 12V = 120W vs 500W for 1/4 load). I estimate it would take a maximum of 5 minutes generator runtime to produce the same amount of charge that panel did in two weeks. Based on the above, 2.5 minutes runtime per week, that forty quid on the solar panel buys me the equivalent of (6000/2.5) 2,400 weeks, or 46 years, generator charge time. While I was happily painting away, suddenly the river came alive with powerboats of all sizes streaming down, heading out to sea. This is definitely one of those times when a camera cannot do a scene justice. 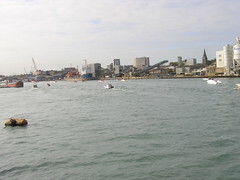 The noise and spectacle of what must have been forty odd boats cruising by was quite something, weather you like powerboats or not. One thing that surprised me somewhat, was that they were all more or less at the speed limit. Usually one boat goes a little faster, then another, then the one that's being overtaken speeds up and suddenly it's an all out race! After rust busting comes priming, of course. I know it looks a bit, well, red. But that's only the first coat of primer. 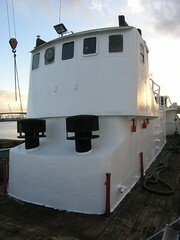 The idea of the red primer is that this is followed with grey, then white primer. That way, as I work towards the bow on the rust busting and subsequent priming, I always know how many coats the various sections have been painted with. Hopefully the weather will co-operate for at least a little bit longer while I get this section done. A bit of a contrast to the last post! It's been a while since I've been down on my hands and knees chipping rust, now the muscles in my arms are paying the price. The rust on the port side there is really the result of not doing the job properly the first time round. Originally, while in Fareham, we just painted over the rusty bits. Now it's time to do the job properly (see the rust bleeding through on the extreme right of the picture). Just the short(ish) stretch you see there has almost filled up that 20L tin in the foreground. That's on top of the chippings Fred produced from this section almost a year ago now. 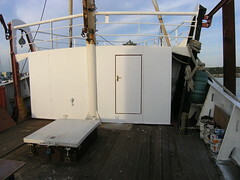 So that's the wheelhouse block all painted white then. There's only the red and black detail to be doing, then that whole section is done. 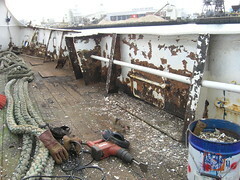 Next on the list will be the inside of the port side bulwarks to rust-bust and paint. I'm hoping this will go fairly smoothly, as there's not THAT much rust to deal with. So here's the voltage chart I was going to do. This shows the battery bank voltages over the course of Sunday. During the morning, the only things running were the pc and, periodically, the fridge. The afternoon was a little busier, with the paint mixer and lights on at various points. There was also a little wind about, which helped maintain the battery voltage. The really deep dip you see is because of the water pump, which only runs occasionally to top up the water pressure (must have been teatime then). A little disappointingly, this is very similar to the chart I posted in September 2008. I had this chart in mind as a comparison, which is why I ran the generator at 10.00! Looking at the two charts, I'd say that there has been no significant improvement in the batteries performance in the last year. I had previously been running the generator whenever practical, to give the de-sulphination unit as much chance as possible to work. After seeing these charts, I think I'll change tack and only run the generator for an hour or so to recharge the batteries when the voltage drops below say 24.4 volts. My system is, after all, setup to work like this. The 24.4 volts is a little arbitrary, but should leave more than enough charge to last through a cold evening with the heating running, without needing to run the generator at an unsociable time. Ideally, I should not have to run the generator at all. Any power I use should be restored over time by the wind generator or, possibly, solar power. So there have been a few questions about my de-sulphuring device, which I posted on some time ago. Rob, how are you getting on with yours by the way? Anyway, my battery refresher, or de-sulphuring device is still very much in use. I see it's been over a year now and the batteries are still steadily improving. It has been a long, slow process. Longer than expected I suppose. Please bear in mind here that the refresher needs at least 25.6 volts before it starts working. To get this voltage needs either a really strong wind for the wind generator to keep the voltage up or for me to run the generator. It is impractical for me to run the generator for more than say 10-15 hours a week, so the refresher does not get that much opportunity to actually work. Obviously as time goes on and the battery improves, so the refresher works for progressively longer because of the wind generator. Initially, the batteries took ages on the charger to get up to 25.6 volts. With the generator off, the wind generator could not keep this up at all, even in a stiff breeze. Some time later, achieving above the magical 25.6 volts was faster, but as soon as the charger was turned off the voltage dropped - even with no load. The wind generator could still not keep up, except in a really strong wind. Before the new inverter/charger, 25.6 became easy to hit and the voltage stayed above this for say half an hour or so, with no load, before dropping off again. The wind generator needed a really good breeze to keep up. With the new inverter/charger the voltage stays above 25.6 with the fridge and a few small lights on for about half an hour. I suspect that's down to a combination of both the new charging regime and the inverters no load efficiency. The wind generator is away getting serviced at the moment, more about that later, but on it's return I would expect it to now keep that voltage above the magical 25.6V relatively easily. Just before I installed my new inverter/charger, I serviced the batteries. Giving the tops a good clean and topping up the cells with the right amount of distilled water. I know I should do this at regular intervals, but have not really got around to drawing up any kind of schedule for that kind of thing. Anyway, I immediately see that the batteries are holding their charge so much better as a direct result of the proper charge cycle delivered by the inverter charger. The now redundant charger, which you can see in the foreground, never delivered the amps the inverter charger delivers. Consequently I'm sure the batteries ended up not being charged as they should have been. The new charging regime has an 'absorption' phase, where 50/60 odd amps are poured into the battery at the start of the cycle. This has the acid inside the battery bubbling away furiously, giving the contents a good old stirring up in the process. I gather this helps eliminate the stratification of the acid and water in the batteries. This seemingly quite aggressive charging seems to be good for the batteries, whereas there's me thinking I was being kind to them these past years, only applying relatively low amperage charges. 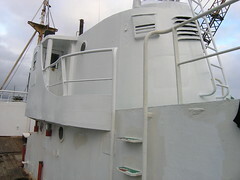 Painting the white topcoat may be a cruise, but there's lots of it to be done. 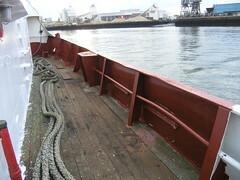 Here you see the top section of the wheelhouse block has been completed. Unfortunately the difference between the done and not done bits does not seem so stark in the picture, but from a distance the fresh white really shows up a treat. 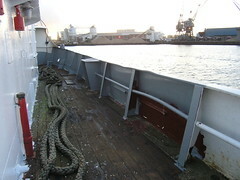 There is a small section to complete topsides, on the starboard side, then there are the rails and the much larger bottom section to be done. Although there is not that much of them, the rails will take quite some time to do as they are so fiddly. One thing though, this white paint is best applied when it's not sunny and bright, else the glare is so bright that you can't tell where you have just painted. Sunglasses help, of course, but you still need to step back to see the bits you've missed. Some jobs on board are really satisfying. None more so than slapping on that coat of beauty paint. 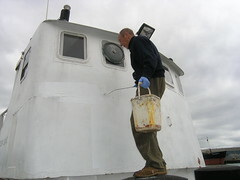 Here you see Fred just starting with the first few strokes of repainting the wheelhouse white. During the summer we have dealt with the rust, and have painted some quite large patches of the wheelhouse block over with primer. The relatively easy, and very rewarding, job of the shimmery shiny top coat had been saved for an appropriate day. Finally, I've got the front part of the workshop complete. I must say, I'm pleased with how it looks so far. I know it's been a while, but it's done now. Next will be to weld on the supports on the sides, then attach the boards to them. I had previously welded up the side supports, but had to cut them back off as when I came to fit the boards I discovered I had welded them up all wrong. Looking at the longer term weather forecast, it looks like I will have the timing of completing this just about right.